This is by far the single most exciting thing you can do on the water! Warm weather, crystal clear water, and Tampa Tarpon Fishing Charters will put on that big Tarpon of a lifetime! Imagine cruising along the beach at sunrise looking for powerful fish that weigh up to 200lbs. Once we’ve spotted them, we move in quietly to present a bait, a 100lb fish eats it and leaps into the air! You hold onto the rod for dear life as the Silver King hits the water and attempts to rip 300 yards of line off of the real at a breakneck pace. Tarpon invade Tampa Bay by the 10’s of thousands during the months of May, June, and July. Tampa Bay is home to one of the largest Tarpon migrations in the world as they come here to gorge themselves in preparation for spawning. Tampa Fishing Charters take advantage of this opportunity every summer as we chase the mighty tarpon. All of our tarpon fishing charters run out of Gulfport, FL which is near St. Petersburg, FL. Most of the time we head south in search of tarpon hitting the beaches of St. Petersburg, Ft. DeSoto, Egmont Key, Passage Key, and Anna Maria Island. 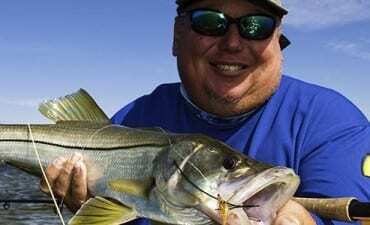 It’s a beautiful area to fish and extremely productive for tarpon year after year. If you’ve always wanted to catch a fish that is as big as you, you owe it to yourself to go on a tarpon fishing charter with Capt. Jim Lemke at least once in your life. Be careful though, tarpon fishing is addictive. You may just find yourself returning year after year just like the tarpon. 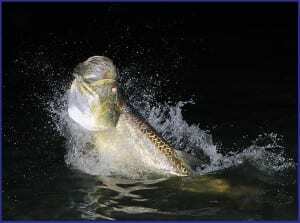 When it comes to Tampa Fishing Charters Tarpon fishing – Believe The Hype! This is an amazing species to Target and offers an even more amazing battle. Capt. Jim Lemke has been operating Tarpon Charters for the past 20 years in SW Florida. As an experienced guide he can put you on these fish during the yearly run when many anglers flood into Florida looking for their turn to battle the beast. Capt. Jim has done everything from Tarpon on the Fly to Tarpon DNA scrubbing as part of a research effort for the State of Florida Wildlife Commission’s Tarpon Genetics Study. What this all means is that when you book Tampa Fishing Charters Light Tackle Adventures for your guided Tarpon fishing trip, you are getting an expert and a Captain that is passionate about this species. Booking a charter today for the next run is something I wouldn’t hesitate with. The lines form and spots fill up fast – Get yours scheduled by booking online at the above link.